The announcement by Washington today that it is appointing an ambassador to Syria – after an absence of five years – is being hailed in the western media as another example of the Obama administration’s “policy of engagement” for regional peace. Five years ago, the US withdrew its ambassador following the assassination of Lebanese Prime Minister Rafik Hariri, which Washington accused Syria of masterminding. Damascus has always denied the accusation. But Syria has long been on the US list of “rogue states”, blamed for “sponsoring state terrorism” through its support for militant groups Hizbollah in Lebanon and Hamas in Palestine. The appointment of US ambassador Robert Ford and the sending of top US state department official William Burns to have talks this week with Syria’s president Bashar al Assad as part of a regional tour does not make any mention of Syria’s alleged involvement in terrorism. In bringing Damascus “in from the cold”, there are apparently no Washington preconditions for Syria to renounce violence or links with “terror groups”. We are led to believe, by fuzzy western media reportage, that Obama’s policy of engagement is simply aimed at adding “impetus to Middle East peace”. Washington’s extended diplomatic hand to Syria must be seen in the context of a ramped US diplomatic offensive against Iran. Only days earlier, US secretary of state Hillary Clinton arrived in the Gulf state of Qatar to drum up support for tougher sanctions against Tehran. These sanctions include the cutting off of vital refined oil imports to Iran. Clinton did her best to enliven the hackneyed US mantra of a “nuclear armed Iran being a threat to the region”. Among the Gulf states, Qatar has a more independent foreign policy towards Iran, maintaining cordial relations with its neighbour to the north. It is no accident that Washington chose this location to shore up its attempt to further isolate Iran. The next stop for Clinton this week was Saudi Arabia, where it was reported that discussions centred on the US urging the Saudis to reassure China over future oil supplies. China depends heavily on Saudi Arabia for energy and it is also a major investor in Iranian oil and gas development. Saudi assurance to Beijing over oil supplies can be seen as a way of bringing China onboard the sanctions bandwagon that Washington is pushing more than ever. This diplomatic offensive comes only weeks after the US announced that it was upgrading missile systems in the four Gulf states of Bahrain, Saudi Arabia, Qatar and the United Arab Emirates. Given this context, the seeming US hand of friendship towards Syria is more accurately understood as the further clenching of Washington’s fist towards Iran. Syria has been one of Iran’s closest allies in the region. 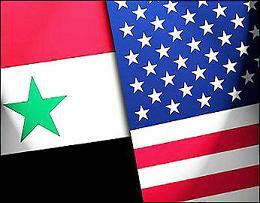 Washington “engagement” with Damascus is better understood to have nothing to do with a search for Middle East peace. By bringing Syria within the US fold, Iran is made all the more isolated and vulnerable to military attack. The latest US “bid for peace” is a cynical move to prepare the ground for war with Iran.